Strathmore Writing products deliver the ultimate handwriting experience and perform beautifully with a broad range of writing instruments. The 50-sheet writing pads and 25-pack envelopes are both natural white, 25% cotton, acid-free, 24 lb. (90gsm) paper. The glue top, flip-over cover allows the paper in the pads to lie flat and be removed easily. The non-photo blue lines disappear when photographed or scanned. 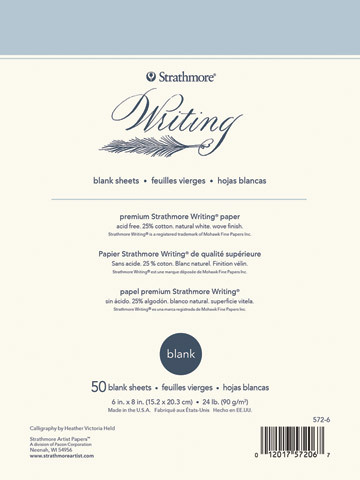 The writing envelopes are the perfect complement to the Strathmore Writing pads. They are available in two standard mailing sizes: the #6 envelopes fit perfectly with the 6" × 8" writing pads and the #9 envelopes are a match for the 8½" × 11" writing pads. The heavy-weight flat and folded correspondence cards are natural white, durable 110 lb. (270gsm) acid-free paper and come with #6 envelopes; 20 sets per box.